The United States suffers from a gun violence crisis, a problem exacerbated by misinformation and a lack of understanding of the epidemic’s dimensions and scale. Knowing the facts can be a first step toward advancing solutions and preventing some of the tens of thousands of homicides, assaults, and other crimes committed with firearms each year. Below is a guide to the data and research that provides a complete picture of gun violence in the United States — and ways to reduce it. More than 38,000 people died from gunshot wounds in 2016. That’s the most recent year for which federal data is available. By that count, the national firearm death rate climbed to 12.0 per 100,000 people in 2016 — a level not seen since the mid-1990s. In 2016, about 59 percent of gun deaths were suicides, according to the CDC. Over the past five years, the share of gun deaths caused by suicide has declined slightly, while the proportion of homicides has increased. Accidental shooting deaths have also declined relative to other gun deaths. More than 80,000 people survive a gunshot every year. The vast majority of people who are shot every year survive. Victims report dealing with chronic pain, crushing medical bills, PTSD, underemployment, and social isolation. The FBI does not track “mass shootings.” Instead, it uses two definitions to describe the phenomenon: “active shooting,” an incident in which one or more individuals is actively engaged in killing people in a populated area; and “mass murder,” an event in which at least three people are killed — excluding the perpetrator — at one time, including during domestic incidents. These narrow definitions of mass shootings are useful for studying rampage attacks like the shootings in Parkland, Florida, Las Vegas, and Orlando. But “active shooting” omits gang shootings and domestic shootings, and both definitions exclude the number of wounded. Counting mass shootings by counting only the dead can therefore underplay the harms firearms impose on those communities. Using a broader definition – instances in which four or more people are wounded or killed in a single incident, under any circumstance — mass shootings occur more than once a day in America, according to three years worth of data from the nonprofit Gun Violence Archive, which culls its statistics from press reports and social media. Despite the attention they garner, mass shootings account for just 1 percent of gun deaths. 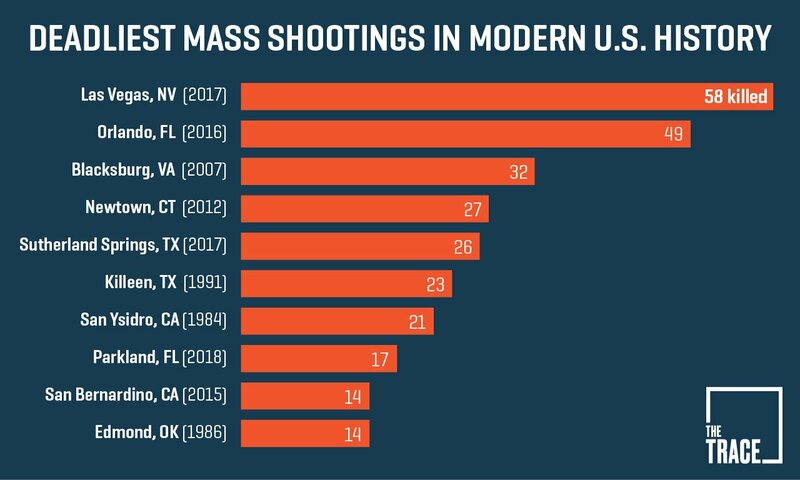 Three of the deadliest mass shootings in modern American history have occurred within the past 12 months. Mass shootings in which 10 or more are killed are occurring more frequently, and are becoming deadlier. Some experts attribute this frequency to the proliferation of high-capacity magazines. Read our guide to understanding mass shootings in America here. An average of 760 Americans are killed annually with guns by their spouses, ex-spouses or intimate partners, according to an Associated Press analysis of federal and state law enforcement data from 2006 to 2014. Eighty percent of those victims were women. Only 13 states have closed the loophole that allows abusive dating partners to possess guns. States that want to include dating partners in domestic violence gun bans have to craft legislation to do so. To date, only 13 have. Many mass shootings stem from domestic violence. An analysis of 2009 to 2015 data by the Huffington Post found that in 57 percent of shootings resulting in at least four people killed with a gun (the site included shootings both in and outside of homes in its criteria), the attacker targeted a family member or a romantic partner. Read more about domestic violence and guns here. Suicides comprise two-thirds of all gun deaths. According to the CDC, at least 44,965 people died by suicide in 2016, the most recent year for which data is available, and 22,938 of them used a gun. That’s up from 20,666 firearm suicides in 2012, a 10 percent increase in just five years. The typical suicide victim is a middle-aged white man. Roughly 80 percent of suicide victims are men, and 83 percent are white. Among Americans aged 10 to 19, there were 2,553 suicides in 2016. Nearly half of those deaths — 43 percent — involved firearms, according to data from the CDC. Guns are a devastatingly effective means of ending one’s own life. In one study that examined hospital data from eight states, firearms suicide accounted for 6 percent of attempts, but 54 percent of fatalities. For comparison, drug overdoses or self-poisoning accounted for 71 percent of attempts but only 12 percent of fatalities. The lethality of guns makes them a vital target of suicide prevention, since 90 percent of people who attempt don’t try again. States with the highest gun-ownership rates have the highest suicide rates. A sweeping study published in July in the American Journal of Public Health found that for every 10 percentage point increase in a state’s gun-ownership rate, there was an associated increase of 3.3 deaths per 100,000 among firearm-owning men, and a .5 increase among women. Separate research shows that gun suicides have increased over the past 25 years in 10 states. Read more essential facts about guns and suicide here. Black men are disproportionately affected by gun violence. Domestic shootings disproportionately kill or injure black women. In 2014, black women were murdered at more than twice the rate of white women. Of black victims who knew their killers, 57 percent were killed by an intimate partner. In more than half of cases where the weapon could be identified, black women were killed with a firearm, according to this report. A New York Times analysis of shootings that killed or wounded four or more people in 2015 found that two-thirds of the victims were black. Seventy-two percent of the victims were men. In the United States, your relative public safety very much depends on where you live, how much money you make, and the color of your skin. A proper understanding of gun violence requires looking not at citywide rates, but rather at neighborhood rates — which can reflect a terrible murder inequality. Neighborhoods located in large cities with high murder rates are much more likely to be home to disproportionate numbers of people with low incomes and people who are black or brown. Nearly 20 American children are shot in an average day. A 2017 CDC analysis showed that 5,790 total Americans under the age of 17 are shot each year. The majority of those victims are in their teens, though that still leaves more than 900 shootings of children aged 12 and younger each year. Twenty-two percent of gun violence incidents involving children and teens are fatal. The racial disparities that exist among adult victims of gun violence are also present among children: black children die from firearm homicides at a rate 10 times higher than their white counterparts. The United States has more child gun deaths than any other high-income nation. More than 215,000 students in the United States have lived through school shootings since Columbine. The Washington Post calculated that since the Columbine High School massacre in 1999, more than 187,000 children and teens at 193 primary and secondary schools have been exposed to a shooting on campus. The Post’s reporting captures the trauma that haunts those survivors. Read our explainer on kids and gun violence in America here. Evidence suggests that stronger gun background checks can mean fewer gun deaths. Federal law requires only requires gun buyers to undergo a background check when purchasing from a federally licensed dealer. Nineteen states extend that to at least some private sales, including those made at gun shows and arranged over the internet. But in the rest of the country, you can buy a gun from a private seller without getting screened to see if you have a record that bans you from owning a firearm. Research indicates that young men who kill other young men, and intimate partners who kill women, frequently have criminal records that prohibit them from owning guns. Eliminating ways for them to get guns without going through a background check can make it harder for them to obtain lethal weapons. What’s more, when states have eliminated background checks on private sales, homicides have soared, while states that adopt universal gun background checks have seen fewer killings. One thing that can lessen the effectiveness of expanded background checks in screening out more people who aren’t allowed to have guns is under-enforcement. A 2017 study of recently enacted universal gun background check laws in Washington State and Colorado found that the measures did not significantly increase the number of checks conducted — possibly because of noncompliance by private buyers and sellers, and a lack of consequences for those flouting the requirement. What might keep guns out of even more of the wrong hands: Requiring a permit to purchase one. Bans on assault-style rifles may reduce gun massacres. Long guns like the AR-15 are used in only a sliver of gun crimes overall, so outlawing or heavily regulating such weapons may not have a big effect on the total gun violence rate. But during the 10 years when a federal assault weapons ban was in effect, gun massacres (defined as shootings causing six or more deaths) happened less frequently, and claimed fewer lives, than they have in the years since. Statistics compiled by the national security consultant Louis Klarevas for the book “Rampage Nation” show that from 1994 to 2004, when the assault weapons ban was on the books, there were 12 gun massacres, resulting in 89 deaths. The ensuing decade had 34 gun massacres, which caused 302 deaths. Bans on high-capacity magazines might be more effective at reducing gun casualties. Magazines are the components that feed semiautomatic firearms, including handguns, ammunition. The larger the magazine, the more times a shooter can fire before reloading. While assault-style rifles like the AR-15 could increase the lethality of an attack in some situations, experts say, it is high-capacity magazines that allow shooters to fire dozens of shots without stopping and cause more harm. And since handguns equipped with high-capacity magazines are increasingly showing up at crime scenes in some cities, regulating them could yield further public safety benefits. Police departments can dramatically reduce youth violence with proven tactics. “Focused deterrence” is a strategy that identifies and directly interacts with people at high risk of committing violent crime. The tactic calls for law enforcement and community leaders to communicate with potential offenders the bad consequences their actions could have, while offering them incentives for not participating in violent behavior. One expert notes a recent study that found that focused deterrence, when correctly implemented, resulted in a roughly 20-60 percent reduction in shootings and killings. “Hot-spot policing” focuses on specific geographic areas — sometimes as small as one block or even one building — then targets them with intensive police patrols. The most effective hot-spots approach home in on the places and people most likely to turn violent, as opposed to broad sweeps. The strategy has repeatedly lowered crime rates in problem areas, and even helped reduce crime in adjacent neighborhoods. Laws meant to keep kids away from adults’ guns may have the best track record for making young people safer. There’s evidence that child-access laws, which punish gun owners who allow children to access or use guns or who fail to store guns safely, may reduce the rate of gun injury among young people between 14 to 20. The analysis, conducted over two years led by RAND, one of the nation’s oldest and largest think tanks, also found some evidence that such policies can reduce suicides among the same age group.